Finally!! This headboard has been in my head for month (you can see the original concept here). 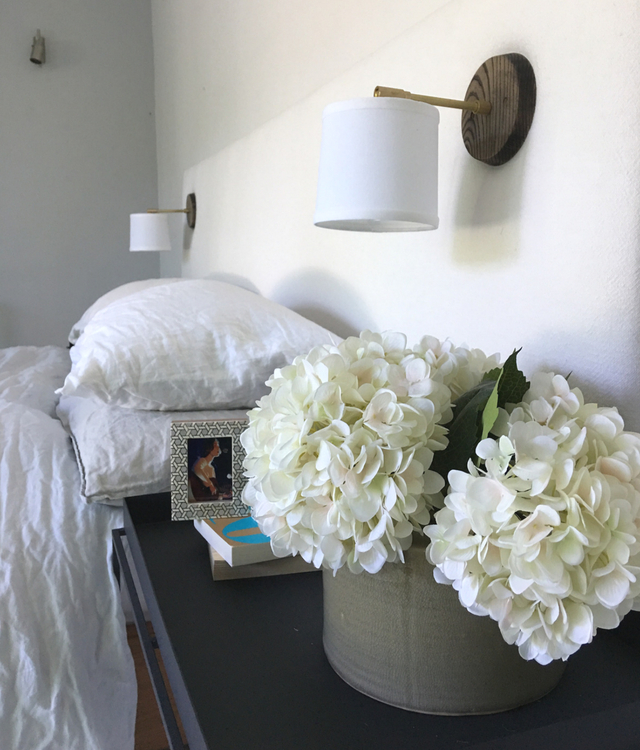 We are renting, and it looks like we will be for at least another year (sigh) so to have the Worleys Lighting sconces in my bedroom that I so wanted, I had to figure out how to get them on the walls without putting any fixings in the walls. It was also time for a refresh, I made the last headboard a few years ago and it never quite worked, and the bedside tables were just to high. 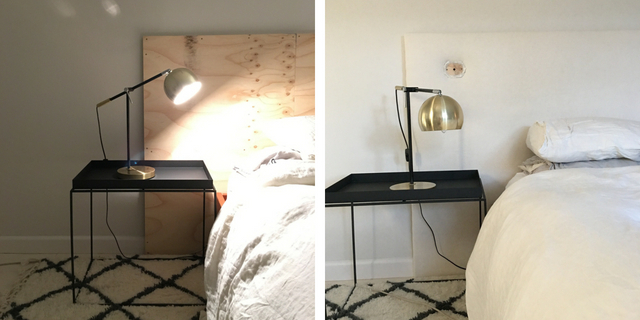 Soooo the concept was to build an extra wide headboard and attach the lights directly to the sides and then plug them into the wall. Originally I was going to only wrap the middle section behind the bed in fabric and attach the lights directly to the wood. But, when I had my supersize piece of ply behind the bed and draped the fabric this way it just didn't look right. So, I decided to upholster the whole piece and attach the lights through the fabric. 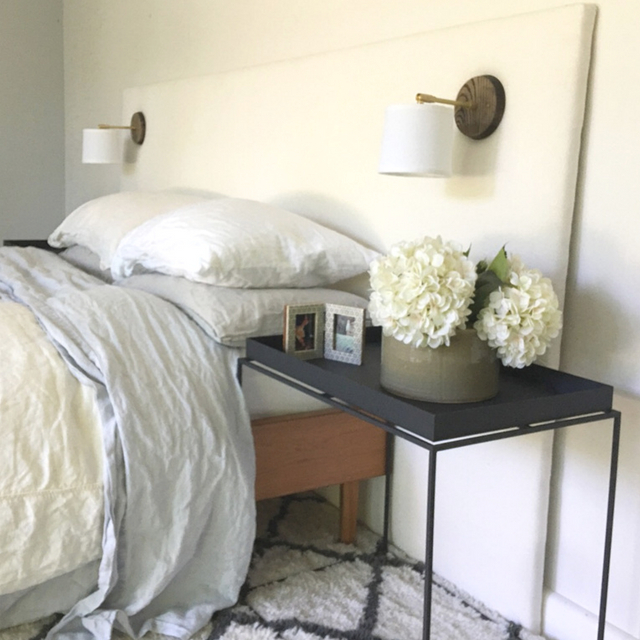 Upholstering a headboard is pretty easy, there are a million tutorials out there and all you need is a good staple gun and lots of staples. Making a hole through the upholstered headboard was a different story. Lots of stories about how not to do it, no success stories. The problem is that when you try and screw through fabric, the screw grabs the fabric and twists it out of shape. I decided to have a test run on a spare piece of ply, after fiddling around, and several wrong turns, this is how you can do it too. First a photo to inspire you to do it too. 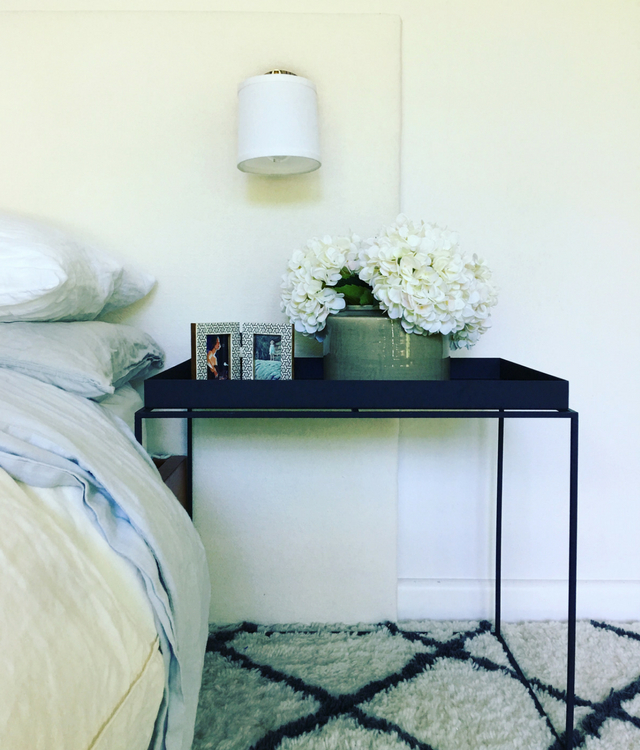 Decide where you want the sconces and pre drill the holes in your headboard. Don't upholster first and try and do the placement afterwards, much to tricky. Drill not only fixings for the light, but a hole that you can feed the electrical cord through. You want the electrical cords to go behind the headboard, neat and tidy. Upholster the headboard as normal. I used a thick batting and a lovely upholstery grade linen with a crushed look. Lots of tutorials out there on how to do it, just buy a good staple gun and deep staples. 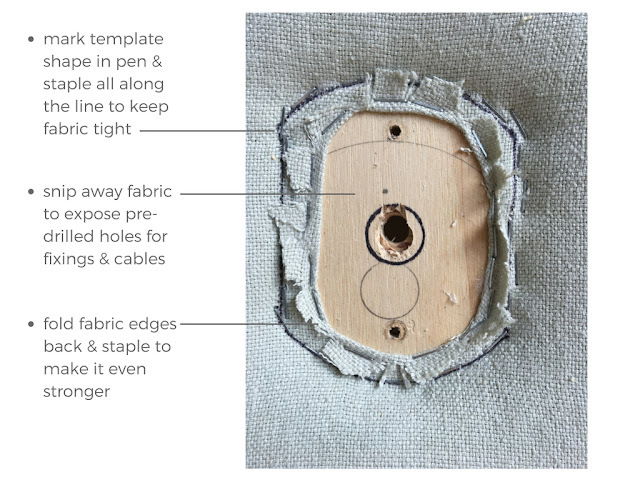 Once the upholstery is done, poke a pen through your pre-drilled holes (from the back) and mark the fabric lightly so that you can see where the light will be placed from the front side. Make a template of the sconce back plate and mark a line edge a cm in from the edge. You want a shape that is slightly smaller than the back plate but extends over the fixing holes. This is just easiest to see in the picture below. Using the pen mark as a guide, place the template on the fabric exactly where you want the light to end up, and trace around it with a pencil. Now this is the important bit. Staple along the pencil line you have marked out. You have made the template smaller than the backplate, so all the staples will fit under the backplate when you attach it. Staple along the full pencil line so that the fabric will stay nice and tight. Now, take a pair of sharp scissors and carefully snip away the fabric covering the screw holes. You are clearing a space which will allow you to put the fixings in without pulling the fabric. To make it even stronger, and try and prevent the fabric fraying, I turned the snipped fabric edges back over the stapled line and put some more staples in. Once you have created a clear space, snip away the upholstery foam or batting. Run the electrical cables through the predrilled hole and attach the sconces. Woohooo! You are almost there. For an even neater finish we cut a 5x5 cm hole at the middle of the base of the bed, just above floor level. We then ran the electrical cables down the back of the headboard, through the hole and up the bed to a switch that we have attached to the edge of the bed with cable clips. The cable then ran back through the hole behind the headboard to the plugs. My sconce is from the USA so I hired an electrician to do the wiring for me. It took about 2 hours but was worth every dollar to know we have wiring that it to code and won't start any fires. Using a sconce wired to Australian standards would have made this easier and also a job you can do yourself. I totally love how it turned out and once I finally started doing it only took me about a day. The problem was deciding how to tackle the thing and, as always, making that first cut or putting in the first staple is the hardest thing to do.